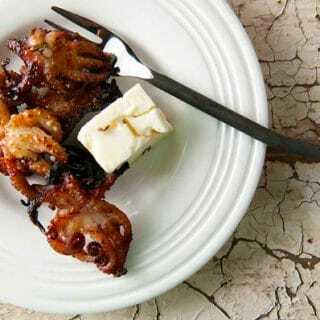 I wish I could tell you that I first ate grilled octopus while sitting at a seaside bistro in Greece, staring out at a Peloponnesian sunset and knocking back tumblers of ouzo, made milky with ice. But I can’t. Sadly, I’ve never been to Greece, although I’ve wanted to go for more than a decade. The Fates seem always to prevent me. Someday. I can, however, tell you that this Greek-inspired recipe is so wonderful I’d happily feed it to Aphrodite, or some mortal facsimile thereof… like Holly, who just so happens to be part Greek. Holly loves octos, and so do I. Enough to post a recipe for a store-bought ingredient. Yes, it’s true. I did not catch these octopuses. I bought them at a fish market. It is my one weakness when it comes to buying fish or meat. If you’ve ever purposefully tried to catch octopus, you know it’s not that easy, even if you are a diver. They are world-class escape artists. There are any number of methods to tenderize octopus, but over the years I’ve found the best way is to slowly braise them in their own juices, over a bed of mixed herbs. If you want a science-based tutorial on how to prep an octopus, read the great Harold McGee’s method in the New York Times. After the octos are tender, the grilling part only adds some char and scorch to the party. Serve these simply, with lemon, a drizzle of fine olive oil and a grind of black pepper. Bread is a must, as are olives. I like some feta cheese with my octos, too. And you gotta have either an austere, crisp white wine — I recommend a Greek Assyrtiko or a French Sancerre — or lots and lots of ouzo or raki or tsipouro. If you like calamari, you will like this recipe. 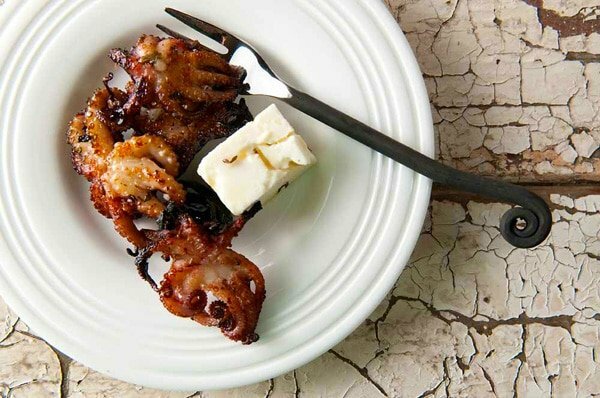 If you like octopus, you will love this recipe. So much so that you will find yourself eating more than you think you might be able to; Holly and I ate this full two-pound recipe at one sitting. And we were not sorry. I used small octopus for this recipe, but it works just as well with larger ones, too. If you use a big octo, you will need to braise it longer, and you will want to cut it into chunks when you are ready to grill. Octopus is readily available at both Asian and Latin markets. There is no easy substitute for octopus, although squid will get you close. Bring a large pot of salted water to a boil and blanch the octopus for 90 seconds. Remove the octopus and let it drain on a colander. Meanwhile, preheat the oven to 300°F. Line the bottom of a brazier, a Dutch oven or other large, ovenproof pot with the herbs and bay leaves. Lay the octopus on the nest of herbs, cover the pot and cook in the oven until tender, which will be somewhere between 90 minutes for small octopus to 4 hours for a really gigantic one. Two hours is about normal. When the octopus is tender, cut it into chunks. Leave small octopi whole. Mix the olive oil, lemon juice, oregano and chile and marinate the octopus in this for at least 1 hour, and as much as a day or two. To finish, get your grill blazing hot. Make sure the grill grates are clean. Grill the octopus over high heat until you get a little bit of charring here and there; they're already cooked, so you are just adding flavor. Drizzle your grilled octopus with really good olive oil, grind some black pepper over them and serve with a wedge of lemon -- and a shot of ouzo. You can marinate your octopus for as long as a day or two beforehand and they will still taste fine. You can also braise on one day and grill on another. Once they've been braised, the octopi will keep a few days in the fridge. You also can serve this hot or at room temperature, so it really is a perfect make-ahead appetizer. For another great octopus recipe, check out my Spanish pulpo gallego. 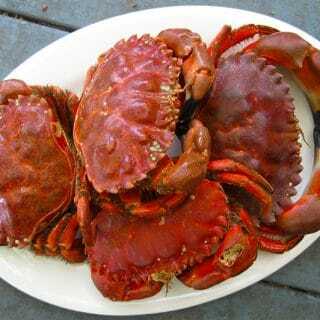 You can find many more recipes for octopus, squid and all other kinds of shellfish here on Hunter Angler Gardener Cook! John: I do. I remove any viscera though.